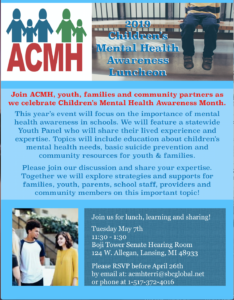 We would be honored if you would join the Association for Children’s Mental Health (ACMH), families, youth, state legislators, policymakers and community partners from across Michigan at the 2019 Children’s Mental Health Awareness Day Luncheon. This year’s event will be held on Tuesday, May 7 from 11:30 a.m. – 1:30 p.m. in the Senate Hearing Room on the ground floor of Boji Tower located at 124 W. Allegan Street. 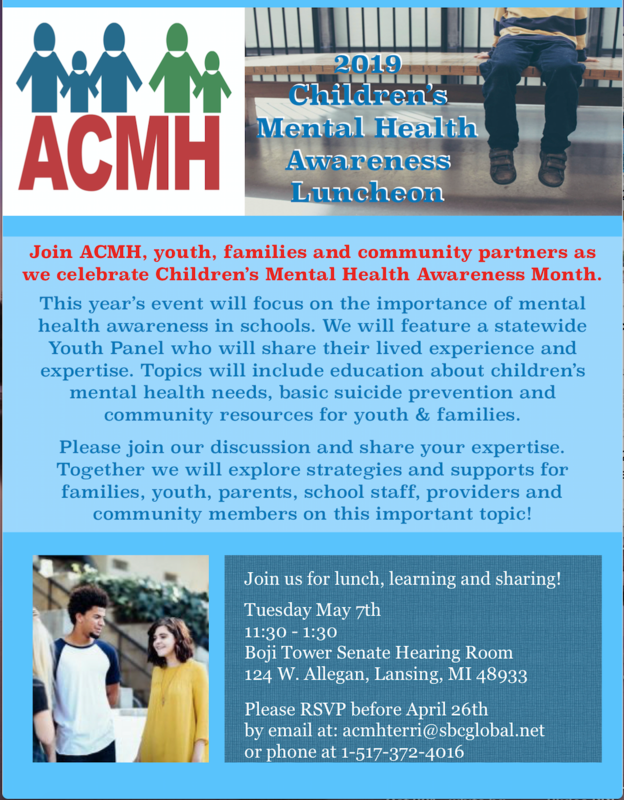 Each year during Children’s Mental Health Awareness Month, ACMH hosts a special event to highlight the importance of children’s mental health and inform state legislators and community partners about the real issues facing children and youth with mental health disorders and their families. This year’s event is focused on the importance of mental health awareness in schools. We will feature a statewide Youth Panel who will share their lived experience and expertise. Topics will include education about children’s mental health needs, basic suicide prevention, and community resources for youth and families. Please join our discussion and share your expertise. Together we will explore strategies and supports for families, youth, parents, school staff, providers and community members on this important topic! RSVP before April 26th by emailing: acmhterri@sbcglobal.net or calling the ACMH State Office at 517-372-4016.